From Japan to India, the nations of Asia struggle to maintain growth, balance their economies, and fight slowdowns. For most of these countries, the days of high-flying growth are long over, while for others, they never began. It is past time for the rest of the world to pay attention to the threats to Asia’s economic health. Uneven development, asset bubbles, malinvestment, labor issues, and state control over markets are just some of the features of economic risk in the Asia-Pacific. And because Asian economies are increasingly interlinked, problems in one country spill over to others. Patrick Cronin, senior director for the Asia-Pacific Security Program at the Center for a New American Security, quoted on KRCR News (February 15, 2016), "Obama welcomes Southeast Asian leaders"
In Europe, in Asia, in Africa and in America, the forces of darkness are at work and no society is spared ... transnational crime . . . undermines the very foundations of the international democratic order. [It] poisons the business climate, corrupts political leaders and undermines human rights. Boutros Boutros-Ghali, cited in Awake! magazine, 1995, 9/8, article: How Is Our World Today? The question of where Europe ends and Asia begins has troubled many people over the years, but here's a rule of thumb: if someone can pose as an expert on the country in question without knowledge of the relevant language, it's part of Asia. Yan Naing Lee: Asians; we never panic. The PAX results reflect the BBC’s ongoing commitment to and investment in Asia, a region that has long been a key market for the channel and one where we are proud to be enjoying such success. BBC World News has revamped its output in Asia, including the successful launch of weekday programme Newsday, presented live from London and Singapore, and introduced specially commissioned series, such as Mishal Husain Meets and Thailand Direct. And as viewers across Asia demonstrate a growing appetite for global news, they’re increasingly turning to BBC World News and BBC.com/news for trusted and impartial coverage of global and local events. Viewers have plenty to look forward to in the coming months as BBC World News moves to its new base in Central London. New HD studios, dynamic presentation and state-of-the-art graphics will enhance the viewing experience and showcase the BBC’s established journalistic credentials in an engaging and compelling way. Jim Egan, COO of BBC Global News. quoted on BBC News, "BBC World News named Asia’s fastest growing news channel", October 10, 2012. On this visit to Asia, I have been concerned that while many of the countries in which I have travelled are deeply aware of the threat of Communist expansion and the spectre of the third world war, they are also apprehensive that the mounting interest of the United States in this area may be just another phase of imperialism…I can say without equivocation: the United States firmly supports the orderly progress towards self-government throughout the world. 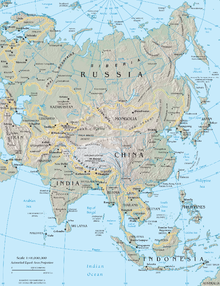 The United States has no imperialistic ambitions whatsoever in Asia or in any other part of the globe. Richard Nixon in Sri Lanka on November 28th, 1953. As quoted on Wordpress, "US Vice President Richard Nixon’s broadcast over Radio Ceylon on 28th November 1953", August 23, 2013. The growth in Asia's Internet has been amazing. Between July and September of this year alone, more than 60 million people in Asia landed on the mobile internet for the first time. That's almost two Canadas, or three Australias. And this growth probably won't slow for some time, since the majority of people that have yet to come online also happen to live in Asia. --Joe Kava, vice president of centres at Google. quoted on BBC News, "Google opens first data centres in Asia", December 11, 2013.
quoted on Living Trading News, "Asia’s Emerging Economies Growth Expected To Slow In 2014", January 13, 2014.
also quoted on Menafn.com, "Growth in Asia's Emerging Economies Expected To Slacken in 2014", January 13, 2014. It is a situation whereby U.S. markets have rallied to record highs, the S&P that is, just a couple of days ago, then of course investors will get a little bit nervous at high levels. I think they'd really like to see the earnings come out just to back up the theory that the U.S. markets are on the mend and is in a much better place now. --Stan Shamu, market strategist at IG in Melbourne, Australia, said the negative sentiment in Asia is a follow-through from the pullback in the U.S. markets. Jonathan Asherson, Rolls-Royce’s Singapore-based regional director for countries in the Association of Southeast Asian Nations (Asean) and the Pacific, quoted on FT.com, "Aerospace manufacturers head to Singapore innovation hub", February 10, 2014. Jon Copestake, editor of the report, quoted on BBC News, "Singapore named the world's most expensive city", March 3, 2014. I am under no illusion that our present strategy of using means short of total war to achieve our ends and oppose communism is a guarantee that a world war will not be thrust upon us. But a policy of patience and determination without provoking a world war, while we improve our military power, is one which we believe we must continue to follow…. Omar Bradley, testimony before the Senate Committees on Armed Services and Foreign Relations, May 15, 1951. Military Situation in the Far East, hearings, 82d Congress, 1st session, part 2 (1951), p. 732. On p. 753, Bradley repeats his conviction that it is "a wrong war at the wrong place and against a wrong enemy". "Fool!" cried the hunchback. "You fell victim to one of the classic blunders. The most famous is 'Never get involved in a land war in Asia,' but only slightly less well known is this: 'Never go in against a Sicilian when death is on the line.'" He was quite cheery until the iocane powder took effect. William Goldman, The Princess Bride (1973), Chapter Five: The Announcement. This dialogue is faithfully replicated in the 1987 film adaptation, The Princess Bride. While no man in his right mind would advocate sending our ground forces into continental China and such was never given a thought, the new situation [Korea] did urgently demand a drastic revision of strategic planning if our political aim was to defeat this new enemy as we had defeated the old. Douglas MacArthur, address to a joint session of Congress, April 19, 1951. Congressional Record, vol. 97, p. 4124.